Hula Hooping Mom: Get Dad to the Doc!! Get Dad to the Doc!! Did you know that new research has found that men are 31 percent less likely than women to have visited a doctor within the past year? In fact, men report making fewer routine health care appointments compared with women (56.5 percent vs. 73.8 percent). The U.S. Department of Health and Human Services Agency for Health Care Research and Quality and the Ad Council are launching a new movement on behalf of their national public service advertising campaign designed to encourage middle-age men to learn which preventive medical tests they need to get and when to get them. My husband just turned forty this year and it seems like all of a sudden we are always at the Doctors office. He has chest pain quite often and has been to the emergency three times always being sent home the same day. But how do we know when we do need to seek emergency medical care or just make an appointment to see the Dr. Most of us I think, including myself seem to shrug off what ever is bothering us until it comes to a point we can't take it anymore and make that dreaded Doctors appointment and then by then the situation has become more worrisome or something we could have prevented if we would have seen the Dr. when we first noticed the symptoms or even by having our regular exams of which so many of us put off. Encourage the men in your life to visit www.ahrq.gov/healthymen, which provides recommended ages for preventive medical tests, a health care quiz designed to test knowledge of preventive health care, tips for talking with doctors, a glossary of consumer health terms and links to online resources to find more medical information. I encourage you to sit down with the men in your life and take a look at the tools needed for a healthy future. 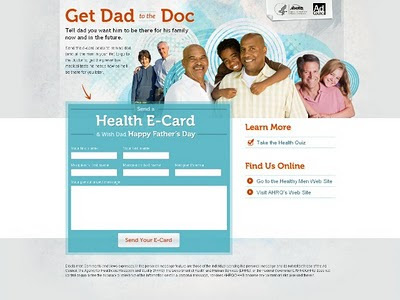 Send the health e-card this Father's Day to remind the men you love about the importance of protecting their health this Father's Day and many more to come. **This has been a part of a campaign hosted to Global Influence and by posting this feature I have been entered to win a $25 gift card. No other monetary compensation has been received.